The characters – Guardians of Middle Earth has a great starting roster. Any MOBA fan will tell you, the characters make the game, and with 22 characters at launch, GoME has a great starting supply that ranges across good and evil, obscure and well known. Each character is set into a class, giving them defined roles in combat. It’s clear a great deal of time was spent in deciding what character should sit where, as fans will be happy to see characters living up to the roles everyone has imagined. Character information is not in short supply either. Knowing who to play, and more importantly how to play them, is crucial for success. GoME hides nothing from the player, giving them a full list of abilities, and going into great detail on how they are used, and the ways to make each particular character excel. The best part is that it’s found out of battle at the Guardian screen. This level of detail and information is what really sets this games characters apart from many other MOBA’s out there. Progression – Leveling up–acquiring new items and guardians–is never a chore in GoME. New guardians cost 5000 coins, but it’s not uncommon to receive 1000 coins for winning a match. It may take a few games before you can purchase a new guardian, but it never feels unattainable. It’s this generous pace that helps set Guardians of Middle Earth above the rest. Allowing the player to access new content more quickly, helps to keep things feeling fresh, where as other games can come off feeling slow and dull, as progression seems to be slow, relying on the player to play dozens of games at a time before obtaining something new. This same ease of progression lies within the item system as well. Guardians of Middle Earth does not feature the typical loot system. Items are bought out of the match, and assigned to a loadout. 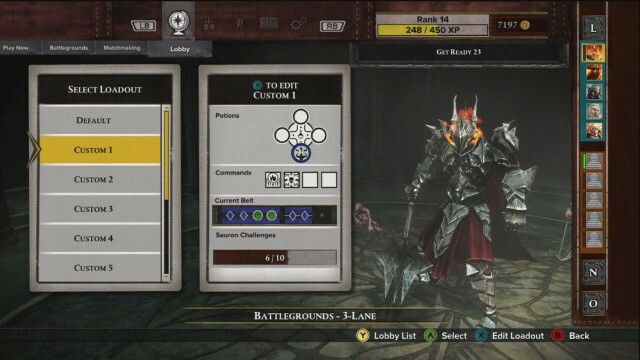 These can then be selected during battle, allowing the player to have a selection of loadouts to choose from during combat, as opposed to buying new items during each match. Purchasing these items happens the same way guardians, and feels equally as fast. You won’t need to spend a week working towards buying just one item, in fact after a week, it’s more than likely you could buy enough items to fill out multiple loadouts. Once again, this speed, the ease at which new things become available, helps to keep this game feeling fresh, and make everything feel obtainable and not locked behind dozens of hours of work. No sacrifices – When thinking of a MOBA, people generally look to PC for the go to experience. The keyboard and mouse have simply been the only control method that seems to have worked for all these years. That is until now. Guardians of Middle Earth has found a way to make the control work without sacrificing a single thing from the PC experience. Character movement feels great and fluid. The right stick is used to direct your attacks, while the face buttons activate your many skills. 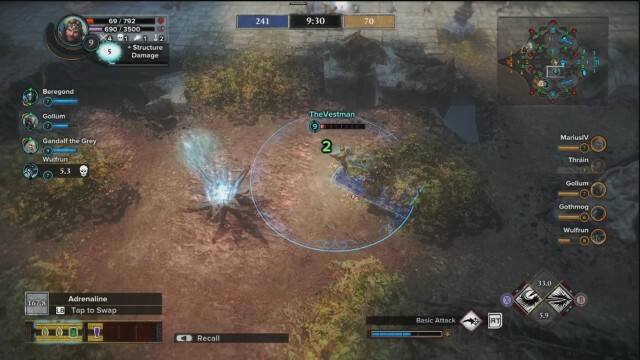 Monolith has left no button out, as each one aids in bringing all the experience of a PC MOBA to the console. The rest of the game feels the same way. Instead of taking away portions of the game to make it fit better on a console, they have instead added to the game, making things clearer than they have been in previous MOBA experiences. Tutorials are built right into the game, and everything has a very clear explanation about what it does, and how it should be used. 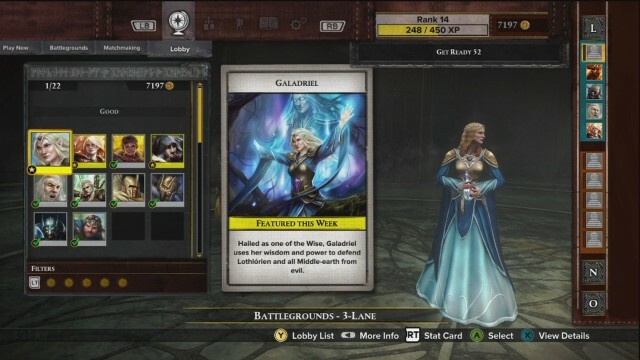 This is exactly the kind of thing that should exist in any MOBA, and it’s great to see it in Guardians of Middle Earth. Xbox 360 is not home to many games of this genre, and it’s smart of Monolith to take this approach, so newcomers to Guardians of Middle Earth are not overwhelmed when they first start up the game. Bots – When playing a practice match, or if a lobby doesn’t fill with players, the game will place bots in all the empty slots. Although they certainly aren’t terrible, they often times seem to be working against you. Jumping between lanes, being overly passive/aggressive and generally acting strange seems to happen just as often as when the bots are actually helpful. They also never seem to take advantage of shrines, and simply let them sit empty for entire matches instead of capturing them. What is arguably their worst offense, is there interaction with the enemy. It’s not uncommon to see a ally walk past an enemy and not stop to attack. This can be even more frustrating should that enemy be near death. Diving on an enemy with your bot ally, only to have the bot turn tail and leave half way through the fight happens more often than it should. Will the Bots cost you the match? Probably not, but they are not going to necessarily help you win it either. The minimap – Maps, and minimaps can be an issue in many games. Sadly this is also an issue within Guardians of Middle Earth. The minimap is rather small, and should you be playing this game on a smaller television, it’s likely to give you issue. The issues will likely be amplified if you are also not playing in HD. The game uses the portraits of characters to show you where they are on the minimap, and this can often be confusing during combat. Portraits will overlap and mesh together, and it’s easy to get confused as to how many players are there, and what team they are on. Although a minor complaint over all, a means to enlarge the map would have been nice, and would of eliminated most of the problems tied to reading the minimap. 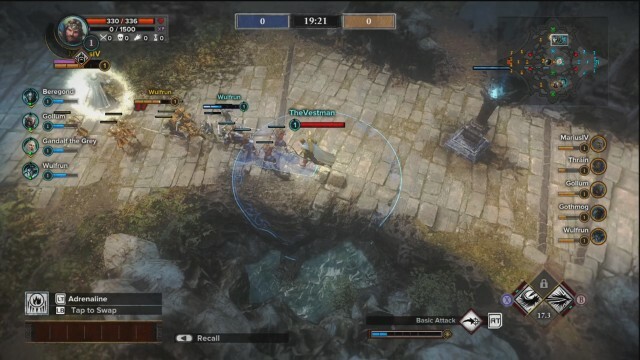 More Lord of The Rings – Guardians of Middle Earth is a great MOBA game. It doesn’t however make much use of the LotR history, outside of its characters. Game modes are pretty basic, and the battle arenas don’t seem overly LotR inspired. A game mode involving the One Ring would have been nice, and seeing scenery from the books, locations like Rivendell or Helms Deep, would have been a nice touch. Although these things are lacking at launch, hopefully it is something that can be brought to the game later via DLC. Guardians of Middle Earth is really good game. For 1200 MSP it’s hard to go wrong. 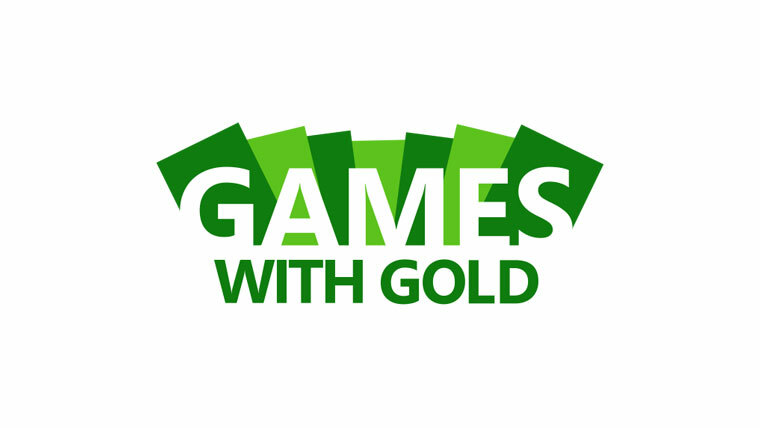 It’s a game with few faults, and can make hours of time disappear without you noticing. It’s the first MOBA experience on XBLA that really nails what a MOBA is. It has turned what traditionally is a PC only genre, and made it fit on the Xbox 360 console. For fans of the MOBA genre, this is most definitely a buy and for people who have never played this style of game before it’s well worth your time. Additional Note : We decided to hold back this review a few days after launch to see how Guardians of Middle Earth played once it was out in the open. Sadly, it seems the game is having frequent connectivity issues. Matchmaking takes 5+ minutes to find a game, severe lag often occurs during matches and sometimes goes so far as to drop you right from the game. It seems these issues do not affect everyone, but quite a few are experiencing it. It is for this reason we recommend you Try It. The game itself is very good, and if these issues did not exist, it would most certainly be a Buy It recommendation, however we must factor in all aspects when deciding what to score a game and due to the matchmaking issues, we chose to lower our score down.